Even if you subscribed last time you need to re-register here so we can get some idea of numbers attending and how many 4WD vehicles and spare seats are available. 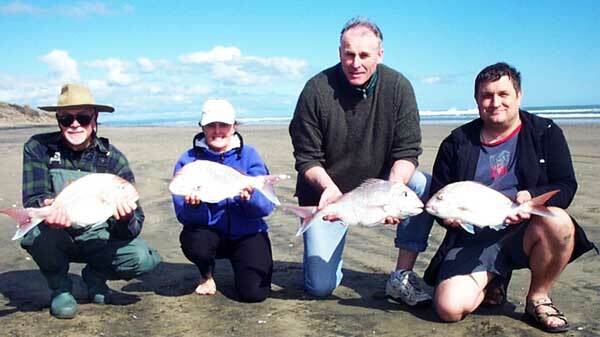 We are hoping to have another one or two free fishing trips in October - November. We have put a location space on the form so you can now tell us where you live. 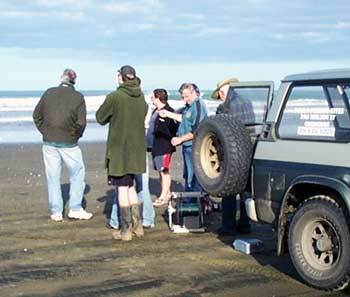 If there is sufficient interest in your area we may even do a free fishing demo there. 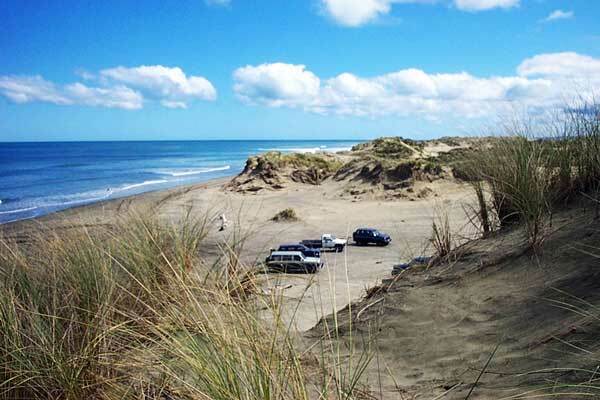 Despite the marginal light wind conditions and because there was a good turnout of 4WD vehicles we decided to head up the beach to the bombing range by the mouth of the Kaipara Harbour. 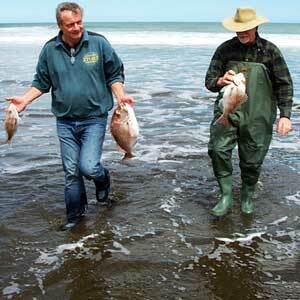 See our Muriwai Beach Fishing Map for more details on this top fishing spot. Fortunately Linda Knott came with her camera and took the photos, thanks for that Linda. The Two Kite Dropper Rig used for the day was set up on a 200 Watt Paul's Fishing Kites Winch spooled with 2000 metres of 65kg line. This is the ultimate kite set up! Above: As we were fishing over the top of the spring tide we parked the four wheel drive vehicles in a gut between the dunes and well above the reach of the incoming tide. Above: Large drifting logs - scenic, a good seat or baitboard - extremely dangerous for the unwary driving on the beach at night. We launched the Mega Mouth Kite in 5-10 knots of north easterly wind and had ample pull to set a full complement of 25 hooks. I had bought fresh mullet bait from my local hawker the night before and things were looking good for a successful days fishing. The team all helped wih the baiting of the traces and weighting of the float - in no time we had the gear setting at about walking speed. As the rig neared 500 metres out a a Powerchute Kite flown on a 50 metre kiteline was attached to the 65kg mainline of the two kite dropper rig. This quickly lifted the mainline out of the water and dramatically increased the setting speed of the rig. 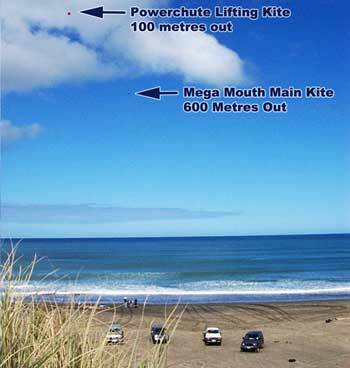 Above: Launching the second kite on a kiteline which is stored on a conventional beach reel or handspool. 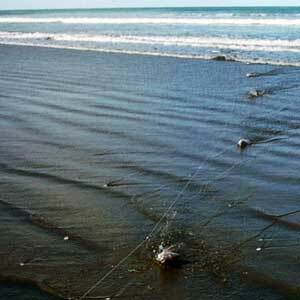 A clip at the end of the 50 metre kiteline is unclipped from the beach reel or handspool and attached to a shock cord fitted into the in mainline of the big rig. Note: Always wrap a few turns of the kiteline around your wrist before you unclip any kiteline with a flying kite on it and don't unwrap it until it is clipped securely to something else. The setting speed of the rig more than doubled as the second kite caught the breeze. Once out to 1000 metres we left it to fish for an hour. We figured if the catch was poor we would let the next set out to 1500 - 2000 metres, at 1000 metres we were fishing our feet first. Below: The Two-Kite Dropper rig with both kites on the same mainline. 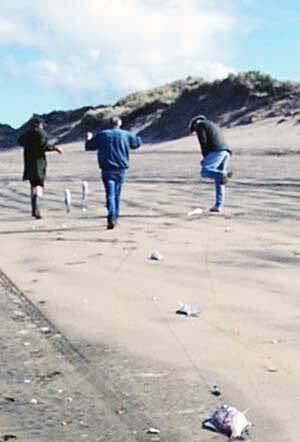 The photo was taken soon after the second kite was launched. The mainline is supported between the two kites. We use Dropper Rigs for all west coast fishing because longlines are too risky on the west coast. Sharks biting through the mainline on longline rigs have been the cause of many kite and kontiki rigs being lost out west. 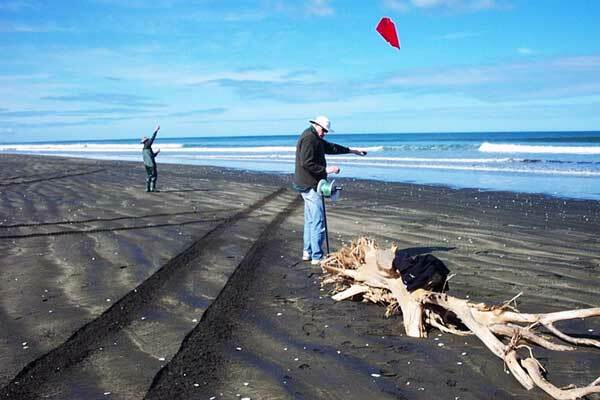 Strong currents on the west coast can also cause difficulties for those using longlines through dragging kite or kontiki longline rigs up or down the beach. Dropper rigs (click link for diagram) are much safer because the mainline is held clear of the water by the kite. This ensures it is out of reach of both sharks and the longshore rip. The reason dropper rigs are so safe and effective is because the hooks and terminal tackle on a dropper rig are deployed on a separate line that is well away from the mainline. 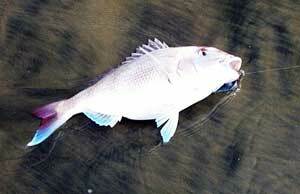 Then it was time to haul the gear, there was fish after fish on the first set and it was mainly snapper. Below: Catch from the first set. The bin below was used to wash the sand off the fish before icing them - over half a chilly bin of top quality fish there. 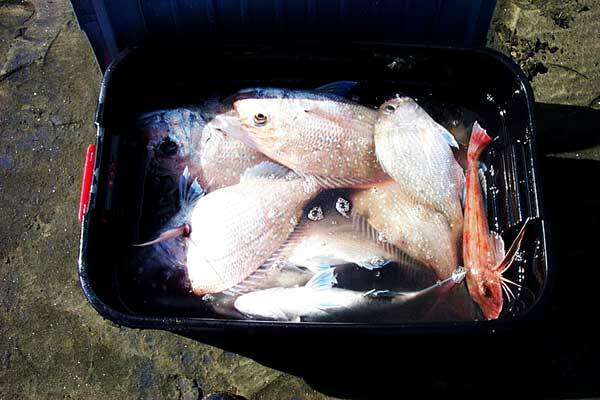 The second set was baited with fresh kahawai we had caught on the first set. The catch was different from the first set - we caught fewer snapper - although we did get the biggest one of the day - and a lot more good sized gurnard. Some present had never seen kite fishing before and were becoming increasing amazed at the quality and quantity of fish we were catching. 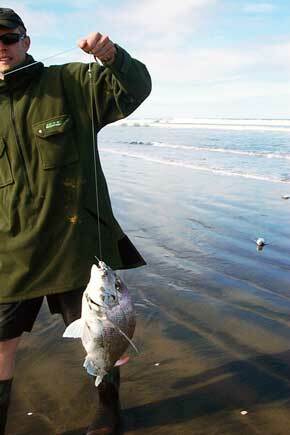 The third set was heavier to haul and the reason became apparent once the hook section was on the beach. We had caught some more good snapper and gurnard - but the back of the hook section had been bitten completely off by a shark. We had lost seven or eight traces and whatever was on them. Thank god we were not using an electric kontiki or kite longline rig because we would have lost the lot. All we had lost was less than $30.00 worth of hook section, weights and traces. 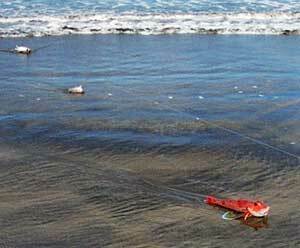 All present realised that this was proof positive that kite dropper rigs are really the safest way to go when fishing the west coast. I'm glad they got to see it. 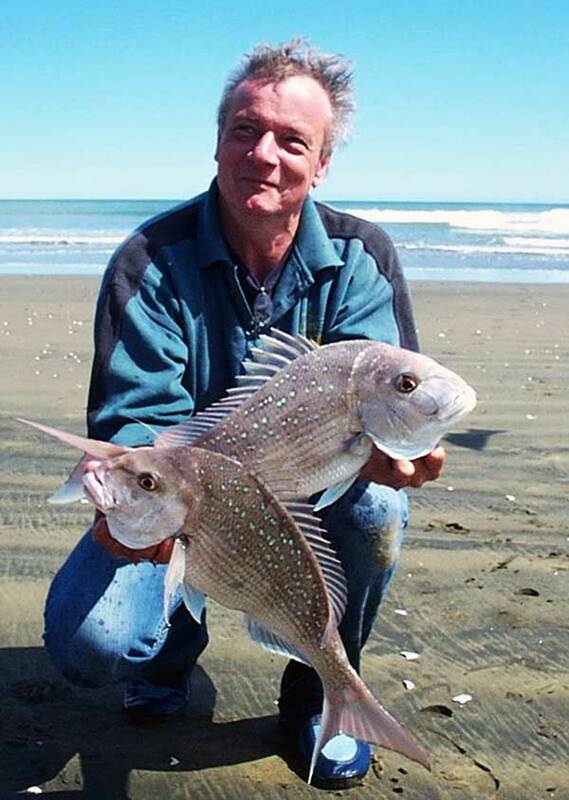 Above: Bill Griffiths with one of the bigger fish caught on the third set. 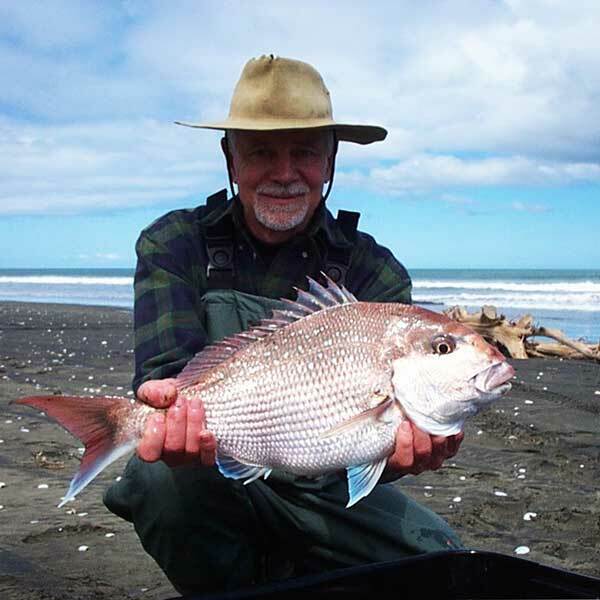 He went out the next day with his 2000 metre dropper rig and had a similar catch. We started doing a fourth set but it got chilly as the skies clouded over and it looked like rain. With the rig still setting and around 500 metres out we switched on the winch and hauled it back in. To our surprise we had caught another three fish despite the fact the rig had not had any stationary time to fish. The fishing was red hot! The three sets of 22 hooks returned and average of twelve fish each. About one and a half chilly bins of fish. 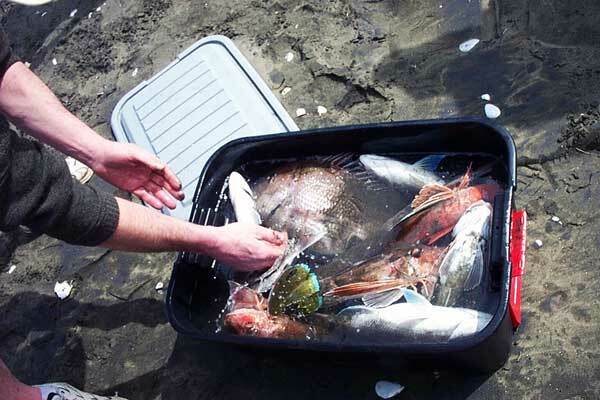 Everyone who attended got a good feed of fish to take home and said they really enjoyed the day. Check out the report on the previous fishing trip held the week before which demonstrated the Roller Up-Rigger System.